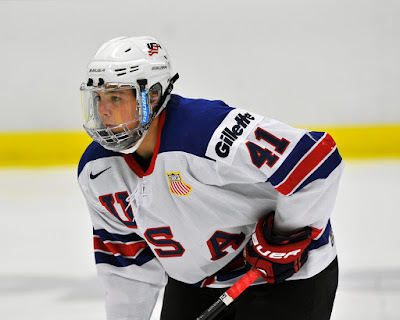 Former Terriers Charlie McAvoy and, Nick Bonino, with their teams bounced from the Stanley Cup playoffs, have joined Team USA in the IIHF World Championships in Denmark. The U.S. gained its fifth win Friday with a 13-1 rout of Korea. McAvoy, in his first game of the tournament, produced a pair of goals and two assists. Bonino is expected to be in the line-up for Sunday’s game against Norway. NHL Network will air the game at 10:15 a.m. ET. BU received its second commitment for 2021 this week with a verbal from right-shot forward Tyler Boucher. The 5-10 native of Haddonfield, NJ spent the past two seasons with Team Virtua (formerly Comcast) and helped lead the organization’s ’03 Bantams to the Atlantic Youth Hockey League championship. Boucher, son of longtime NHL goalie--and current NBC hockey analyst-- Brian Boucher, scored 37 points in 21 games, fourth best in the AYHL. BU’s first 2021 recruit, Jeremy Wilmer, led the league with 73 points. He will enroll next season at Avon Old Farms where Bonino, Patrick Harper and 2019 recruit Trevor Zegras prepped. Tyler Boucher committed to BU today after a great showing at WSI. ‘03 F heading to Avon Old Farms. Plays heavy, goes to the net hard, goal scorer, plays with edge. Four-star prospect is fast, slick, smart. Explosive on his feet. Instinctual player. Facilitates by extending possession and dishing. Rocket shot. Excellent work ethic & versatility. A- at World Selects. Pro upside. Both Boucher and Wilmer participated in the recent World Selects Invite in Philadelphia, featuring top 2003-born prospects. New England Hockey Journal’s Jeff Cox rated the top players at the event, including the two future Terriers. Boucher had eight points (4G, 4A) in seven games and Wilmer had nine points (6G, 3A) in six games. Just four days after the conclusion of this tournament, the son of Brian Boucher committed to play college hockey for the Terriers. Boucher played on a line with Saganiuk and he was fun to watch as well. He has more pro upside with his size, strength and skating combined. He crashed the net and went to the scoring areas often for rebounds and passes. He is able to dominate below the dots. He wins battles and can hold onto pucks. He has an explosive stride when going north and south. He’s physical and delivered a few huge hits. Wilmer was quiet here at times, but has the ability to turn it into high gear at the drop of a hat. He’s small, quick and crafty. He can maneuver in and out of traffic with his skating and stickhandling and has the hockey sense to make things happen. Tyler Boucher, #10 Canadiens, Right Shot, Team Virtua - He has a quick stick and was a good skater. His speed into the zone down the left wing started a scoring play. He also made a really nice pass to spring a teammate on a partial breakaway. He had a heavy shot as well.